Another project almost complete. 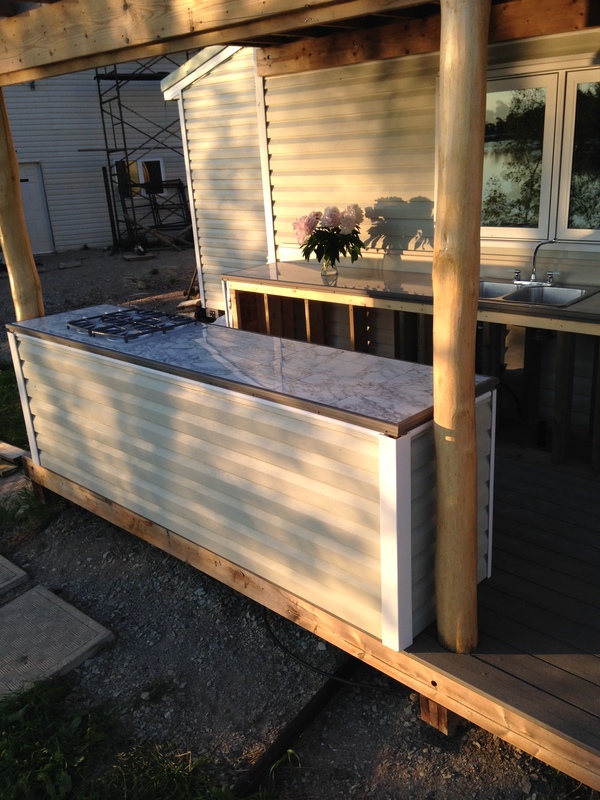 The building of the outdoor kitchen is done. 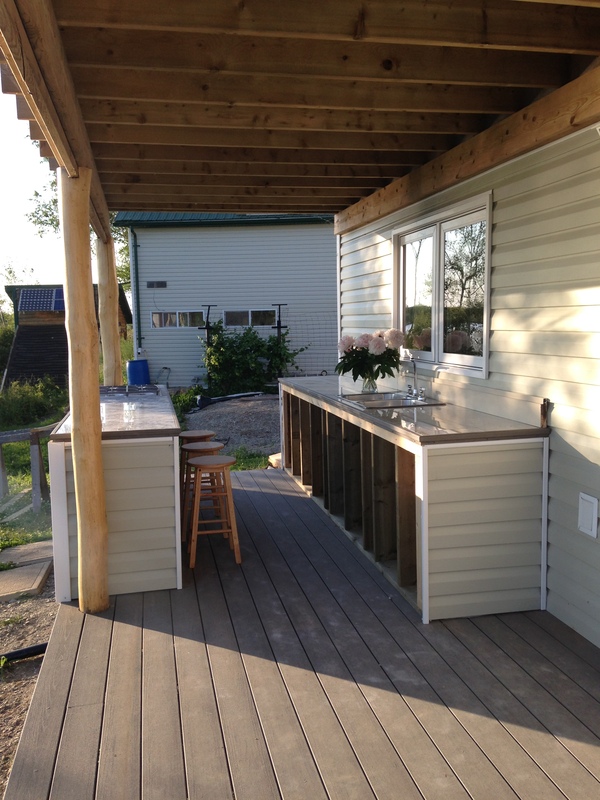 Just waiting for the hookup of the propane stove and the plumbing on the outdoor sink. Although we can’t cook or wash outside yet, we are already enjoying this space. 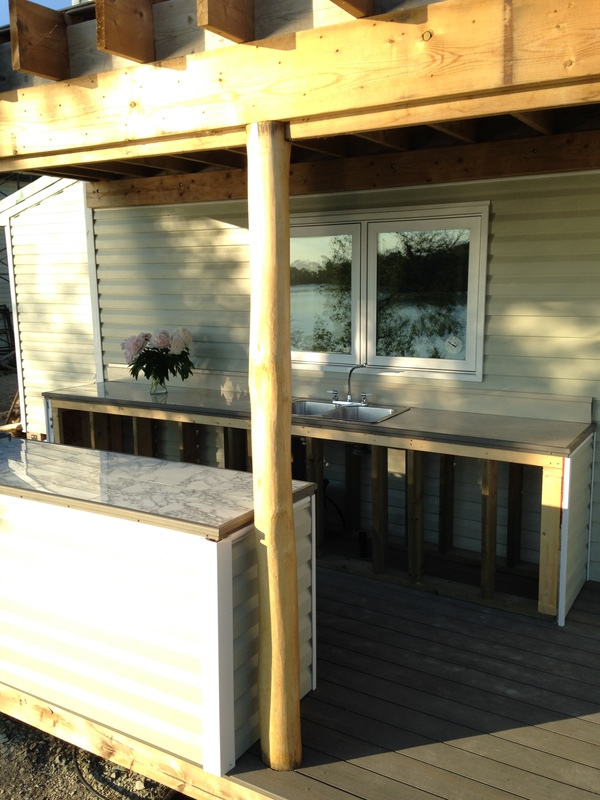 The outdoor kitchen is right off the indoor kitchen on the part of the lakeside deck under the balcony. The balcony gives some protection to the kitchen and also provides shade. 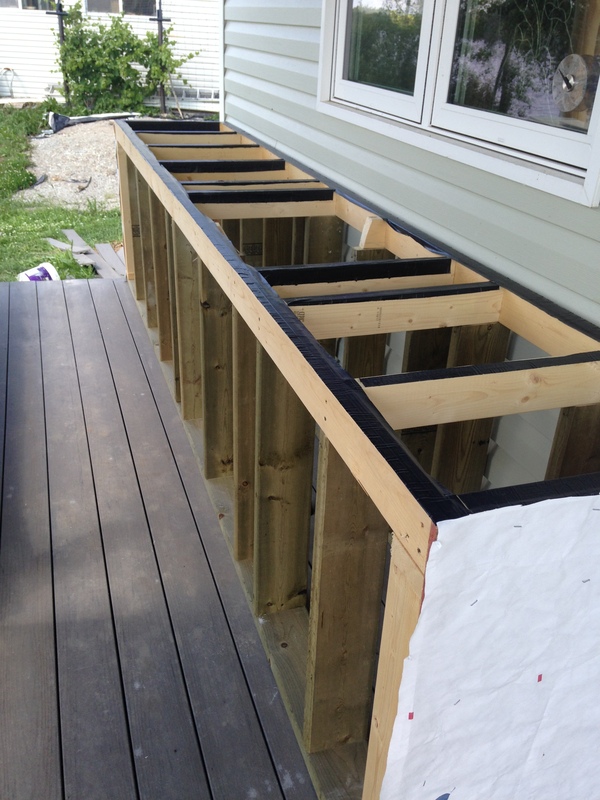 This part of the deck is 8 feet by 20 feet so we had lots of space to play with. The kitchen consists of 2 counters, the one on the inside, against the house wall, is 12 feet long and has a double sink. The one on the outside edge of the deck is 8 feet long and has a propane cooktop. Ken C was over for the weekend while I was away and the boys managed to finalize the plans and build the carcasses (in between golf games). When I returned home the countertops were ready to finish. 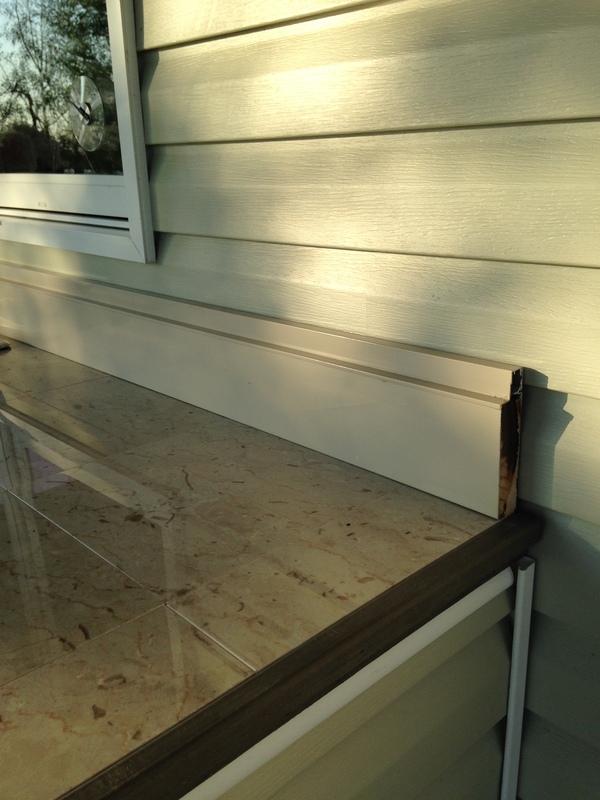 First we applied a waterproof strip to the tops of the studs. 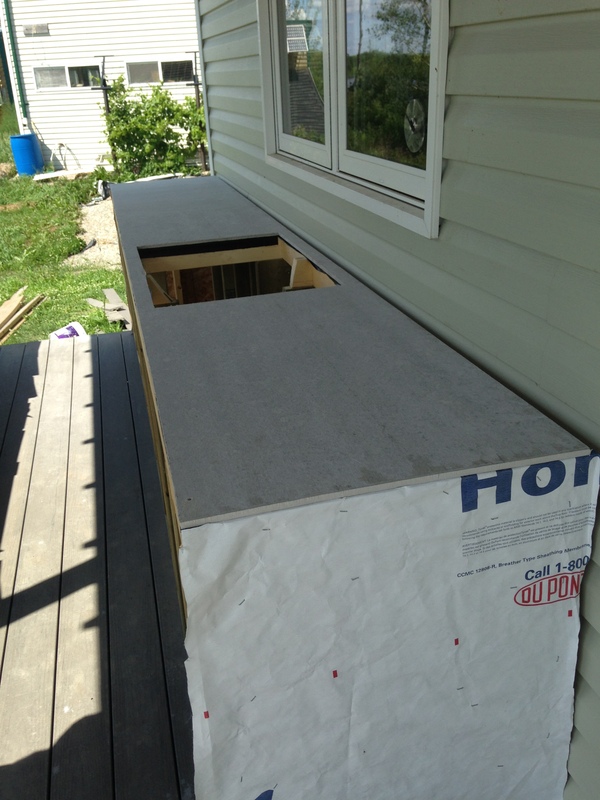 Then we place the concrete board top on. 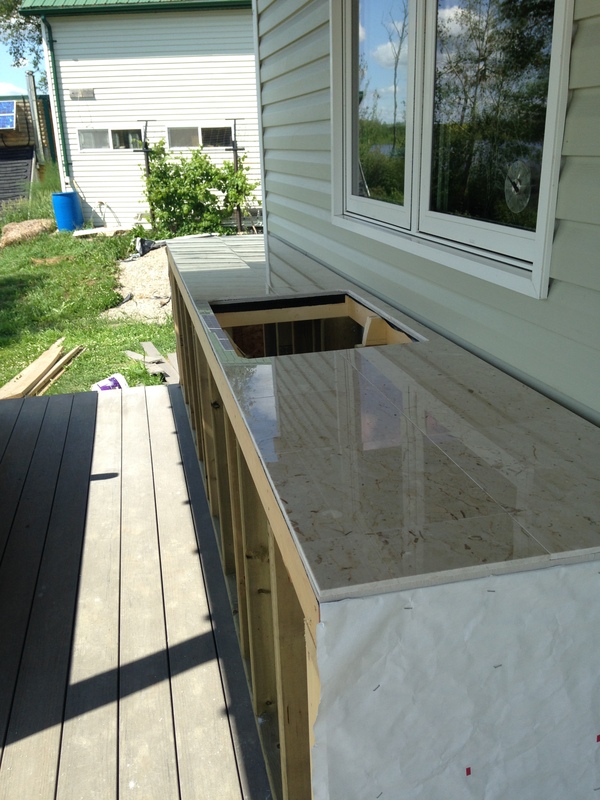 Then the tiles that would form the counter top were put in place. We are using marble tiles that we purchased on Kijiji a few years back. We got them at a great price and were intending on using them in the foyer, but changed our minds. They were perfect for these counters, especially since we discovered they were 2 different colors, brown and black! And we had just enough to do each counter – one in brown veined marble and one with black veins. Since winters here are freezing, we decided not to glue or grout the tiles, but rather just to lay them tight together. That way they shouldn’t crack over the winter. (but we will tarp the counters to keep the snow off) The tiles are held in place by an outside molding made from leftover pieces of composite decking. The backsplash on the sink counter is another leftover find. When the boys were planning the counter they decided it really needed a backsplash. While scrounging through the garage they found the perfect solution – metal clad door jambs that we never used. The sink was another find. Thanks sister Sheryl for spotting it in the back alley. The taps I picked up on Kijiji for $15. 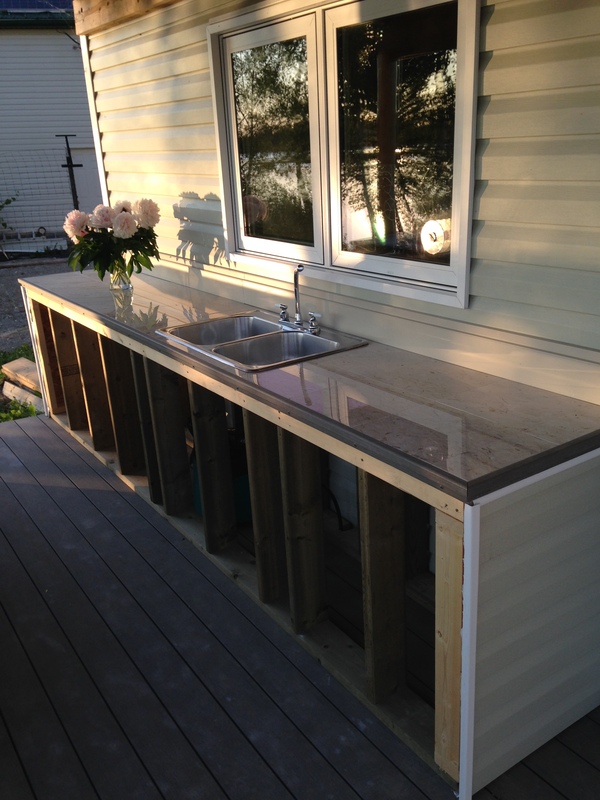 The sides and deck side of the counter are chipboard covered with Tyvec house wrap and sided with left over vinyl siding from the house. It provides a nice waterproof finish and ties the kitchen into the house well. The propane cooktop was originally purchased to go in the indoor kitchen, but we changed our minds. I much prefer having the cooktop out here since it will only be used in the summer, when the wood fired cookstove inside is not in use. I can’t wait to get this hooked up and in use! Right now, during the summer, I cook using a variety of small electrical appliances and an induction hot plate. However, electrical appliance use a fair bit of power and so my cooking is limited to when the sun shines. I can’t wait to make myself a cup of tea at 9 pm – a luxury I don’t have now. We left the insides of each counter open, with possibility of adding doors later. But for now there is plenty of room to store the stools used to create a breakfast bar on the stove countertop. And the view is great. The outdoor spaces really add to the living space. We enjoy the veranda with its morning sun and afternoon shade and a lovely view of the garden. 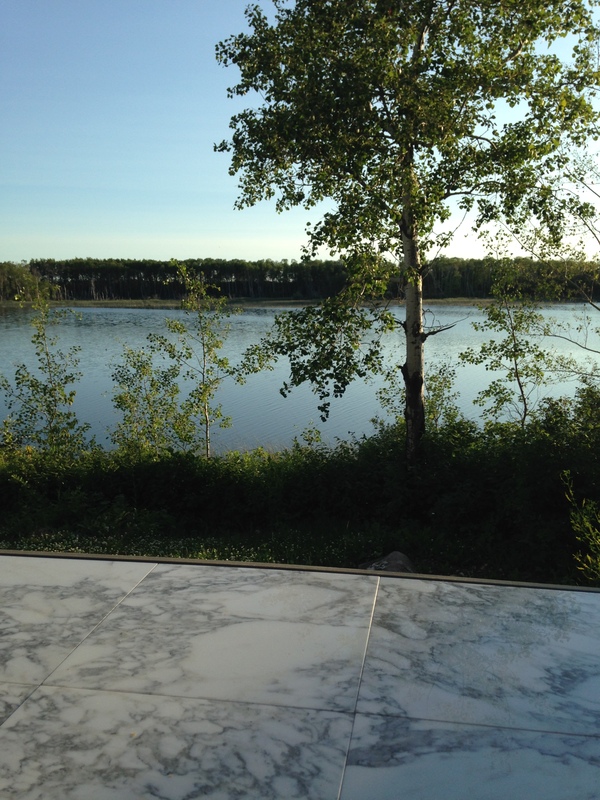 And now the west side deck with the view of the lake and afternoon sunshine, and a fabulous outdoor kitchen. While this deck can get hot when the summer sun is shining, the kitchen is shaded by the balcony. 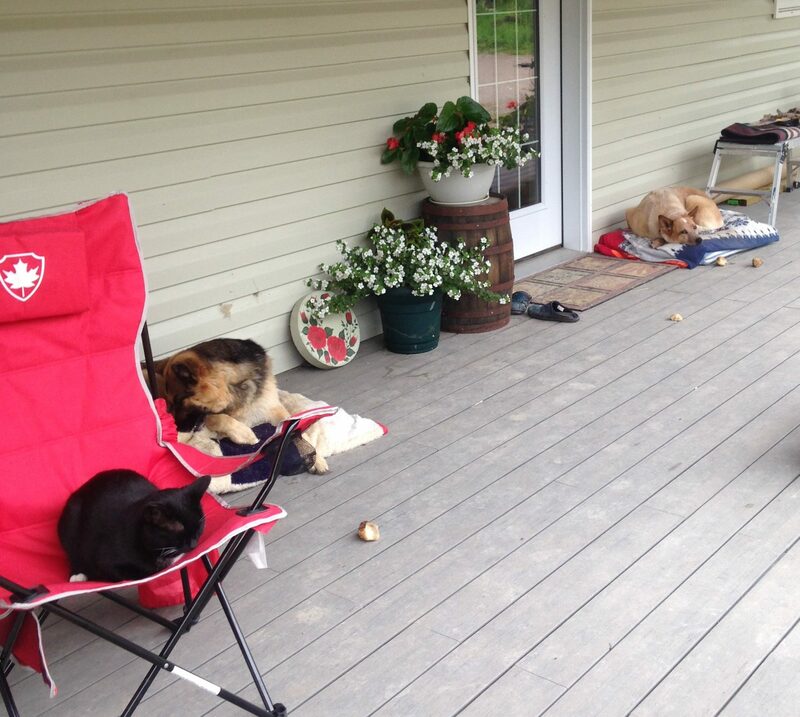 When the afternoon sun hits the lake deck, the pets (and people) can always opt to enjoy the cool of the veranda. Hanna and Sox with visiting Kensi enjoying a snooze on the veranda. We have lots more plans for the lake side, including a kitchen garden, a strawberry patch, a wood fired oven, a fire pit and much more. Of course not all will transpire this summer. This entry was posted in Cooking, Decks, Dining Room, Food, Kitchen, Outside living space, Veranda and tagged outdoor kitchen, outdoor living space, propane cooktop. Bookmark the permalink.